An Editorial Response To "ladowntownnews.com's" article about Paul Solomon's new "Walnut" project in the LA Arts District. Having been an artist in the LA arts district for 30 years, I had the unfortunate experience of having developer Paul Solomon as a landlord. And I use the term "landlord" loosely. Slumlord would be much more appropriate. Paul Solomon was a nightmare as a landlord for any artist and I would warn all potential tenants thinking about moving into one of his buildings to stay away from any artist loft under his management! Paul Solomon does not care about his artist tenants. He's just a self serving plutocrat trying to make more money for himself and that's a verifiable fact. These are all verifiable facts and can be found in legal documents posted on LAArtsDistrictBlogs.com, Wurstkucheblogs.com and WurstkucheSucks.com. Paul Solomon illegally allowed the Artist in Residence at 806 E. 3rd St., the loft directly next to my studio, to be used as a noisy 24 hour commercial warehouse by Wurstkuche Restaurant next door, and literally disrupted my life and all the actual artist that were trying to live and work around this 24 hour illegal nightmare. 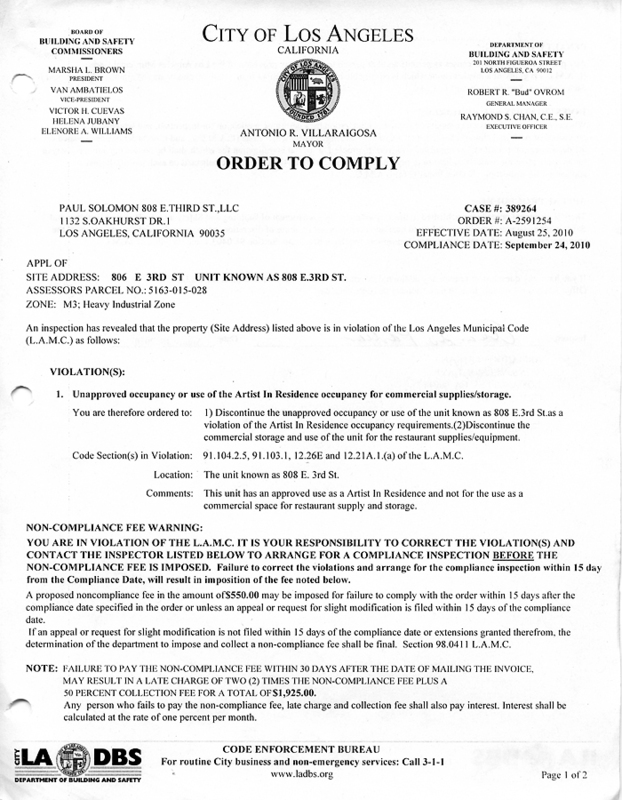 Paul Solomon and the owners of Wurstkuche were cited by the city of Los Angeles for that illegal use but to date have never complied with the city's "Order to Comply". 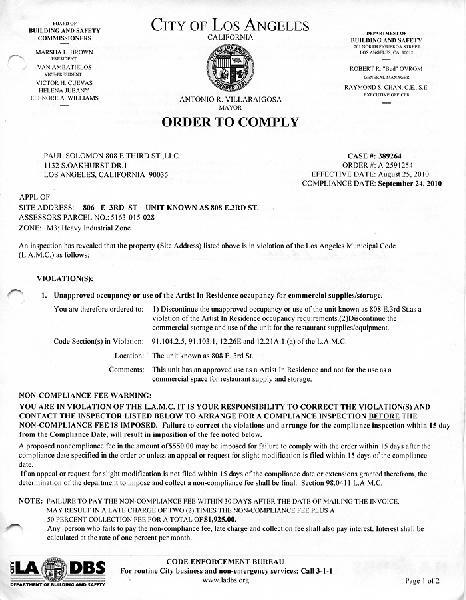 Again, Paul Solomon was cited by the city of Los Angeles for the illegal use, but refused to stop it because he didn't want to give up the commercial rates that rental was creating for him. Solomon screwed the artist's actually trying to live and work there! Is that the kind of landlord an artist or anyone for that matter wants? That's just sleazy! I literally had to move out of my studio because Paul Solomon and the owners of Wurstkuche made my life and my loft an unlivable 24 hour nightmare, and did so in what was supposed to be the heart of the LA Arts District. That is Paul Solomon's legacy to the Arts District. He can build all AIR's he wants, that will not change who he is as a person. And in my opinion, he's a sleazy self serving slumlord and I warn any artist to stay away from any so called artist building he is a part of.